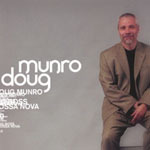 Doug Munro's sixth CD for Chase Music Group is a return to a traditional bossa nova trio, dropping the keyboards or sax utilized on most of his earlier projects. He is joined by bassist Michael Goetz, with Jason Devlin and Jason Anderson sharing the drum chair, all who primarily play supporting roles. The guitarist has a light touch and generally stays close to the melody on most tracks, opening with a shimmering treatment of Chick Corea's "Spain" (which itself is based in part on classical guitarist Joaquin Rodrigo's Guitar Concerto) and following it with a hip bossa nova arrangement of Thelonious Monk's bluesy "Bemsha Swing." Sonny Rollins' blues "Blue Seven" has not been recorded often, but Munro's scoring blends elements of bossa nova and calypso rhythms. An extended workout of Freddie Hubbard's "Little Sunflower" works well, though his best playing of the date may be in a relatively straight-ahead interpretation of Wayne Shorter's "Fee-Fi-Fo-Fum." Of his several originals, the mid-tempo bossa nova "A Day at the Races" is the highlight, even though it is thinly disguised reworking of Dizzy Gillespie's "A Night in Tunisia." There are some misfires though. Rocker Beck's "Devil's Haircut" is rather monotonous in spite of Munro's best efforts, while the original "Prayer" is a bit too pop-flavored and sounds as if it is derived in part from Eric Clapton's "Tears From Heaven." Track Listing: Spain; Bemsha Swing; Stick N' Stones; Devil's Haircut; Blue Seven; A Day At The Races; Little Sunflower; Fee-Fi-Fo-Fum; Something I Heard; Prayer. 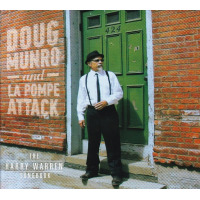 Personnel: Doug Munro: acoustic guitar, Takamine guitar, hand percussions; Michael Goetz: bass; Jason "J Dog" Devlin: drums (2-5, 7-10); Jason Anderson: drums (1, 6).